Made up of teens and adults interested in planning and implementing programs and activities for our parish youth. The size of the committee is approximately 20-30 energetic youth, with a desire to improve themselves, each other and the community around them. This group meets twice a month on designated Mondays (usually the 1st and 3rd) from 7:00-9:00 p.m. Throughout the school year, high school teens meet weekly in the homes of couples we call “Godparents”. These weekly two-hour sessions include teaching, discussion, activities and social interaction. Ideally, the same group of teens and adults remain together for all four years of high school, forming a strong faith community and Christian support system. Within the Godparent Program, each grade level has special opportunities. The Freshmen begin the year with an all day retreat; each Sophomore group has its own individual Lock-In; Junior groups join together for a weekend retreat; and the Seniors conclude the year with an all day retreat and finale dinner! 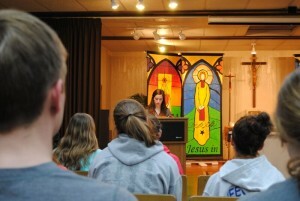 Sophomore through Senior groups also plan and participate in a Sunday Liturgy. Godparents have a four year commitment (2 hours each Sunday throughout the school year and one monthly meeting, 2nd Tuesday of the month from 7:30-9:00 PM). Another highlight of our high school youth program is our annual trip to Appalachia during which teens and college students live and work among the poor. In this week of service, teens and college students are joined by other groups from across the country and often receive far more than they give.